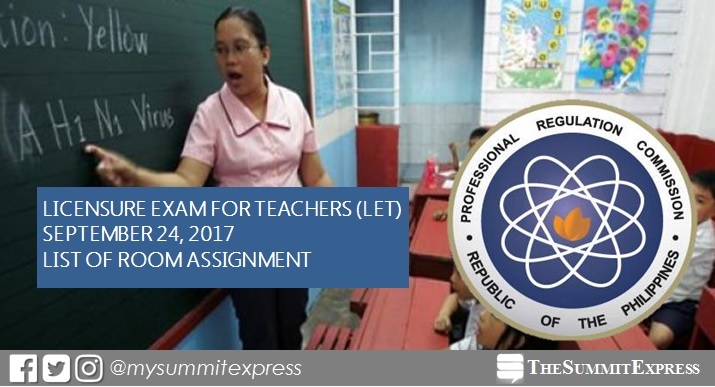 MANILA, Philippines - (UPDATED) The full list of room assignment for September 2017 LET - Licensure Exam for Teachers or teachers board exam for at least 27 testing centers in the country and in Hong Kong and Bangkok (Special Professional Licensure Examination or SPLE) was officially released online on Wednesday, September 20. The Professional Regulation Commission (PRC) and the Professional Regulatory Board for Professional Teachers (BPT) announce the room assignment for over 150,000 expected total takers (Elementary and Secondary) of the second LET this year on Sunday, September 24. In view of the several requests of Local Government Units (LGUs), recommendation of PRC Regional Offices and with the signified support of the Professional Regulatory Board for Professional Teachers (Board), the Commission announces the designation of Mamburao, Occidental Mindoro; Calapan City, Oriental Mindoro; Odiongan, Romblon; Kidapawan Cotabato, Boac, Marinduque; Virac, Catanduanes; Puerto Princesa City, Palawaan and Masbate City as additional Testing Centers for the September 2017 BLEPT through Resolution No. 2017-1047. Note: Separate test booklets will be used for the General Education (GE) and Professional Education (PE) subjects for both elementary and secondary levels in the September 24 LET.